The Dark Mirror offers readers an in-depth examination of the relationship between psychiatry and film noir. The context of the book is the post World War II boom in the popularity of studies of the mind and subconsciousness, as well as the increasing number of films that would posthumously be regarded as film noir, and examines the relationship between the two. The rise in the popularity of psychiatry bled across to mainstream crime/thriller cinema and the proliferation of its themes and motifs were widespread. 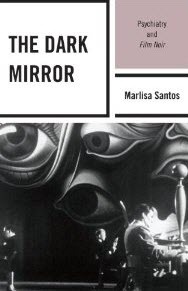 Through Santos’ research and extensive use of case studies the audience is offered an in-depth insight into the Dark Mirror. The book examines five main manifestations of psychiatry in the noir films of the 40’s, 50’s, 60’s and 70’s. These include psychiatrists, asylums and treatments, amnesia, neuroses and psychoses, and the gaslight phenomenon. The noir psychiatrist is an immensely popular figure in the noir films, and “articulates Hollywood’s preoccupation throughout the 1940’s with the subjects repression and displacement, paranoia and pathological doubling” (1). Psychiatrists feature heavily, or are referred to in passing, in countless noir films and this preoccupation mirrors the growing popularity of psychiatrists and studies of the mind. The fascination with asylums and the treatment of mental problems stems in part from the proliferation “in popular culture of the 1940’s and 50’s of stories about shell-shocked World War II soldiers and the solutions to their maladies that were being developed by US military doctors” (35). The heavy media attention that the psychological treatment of the WW II soldiers garnered helped to shape the noir’s fascination with mental problems and their possible treatments. The theme of amnesia also plays a vital role in noir films and is expressed by Santos as “experiencing a literal loss of self that becomes metonymic of their figurative angst” (63). Amnesia features within the noir in two keys ways that of the returning solider and that pertaining to the average citizen both suffering from a loss of memory and attempting to function in society. Another theme of great importance is the fascination with neuroses and psychoses, and in the noir films “it is almost impossible to turn around without bumping into someone who is peripherally or grossly maladjusted” (pg 97.). The last topic covered stems in part from “neuroses and psychoses” and is that of the gaslight phenomenon, in which the subject’s insanity is induced, and another character attempts to make the protagonist believe he or she is mentally ill.
Each of the manifestations of psychiatry is examined in great depth through close case studies of a number of different films, which provides the reader with a great illumination as to how the theme or motif is applied in the cinematic space and how these films interact and affect one another. The use of extensive case studies also gives the reader insight into the number of different treatments of a specific theme and how each film could employ them in different ways to different ends. This gives the reader a broad understanding of how each of the themes is utilised by the noir films and how they fit within the broader social and political sphere. The book makes an incredibly poignant and important contribution to the field of cinema studies and specifically to noir and its relationship to the psychiatry. The use of social commentary and background aids the readers informing of an understanding of the context out of which psychiatry in noir grew and the role it would play. The one potential negative that this heavy reliance upon close case studies brings, is the repetitive nature of the work. Each chapter begins with a brief expounding on the five major manifestations of the psychiatry and then Santos spends the bulk of the chapter examining movie case studies to reinforce her point. The result is not only repetitive and a little tiresome at times but it seems to hold Santos back from postulating her thesis on the topic of psychiatry and the noir films in the depth that it deserves. Santos has written a concise and astute book, that successful examines the relationship between noir and psychiatry in the post WW II context. It gives the reader a detailed understanding of the five major manifestations of psychiatry in noir and provides a close reading of a large array of related feature films.